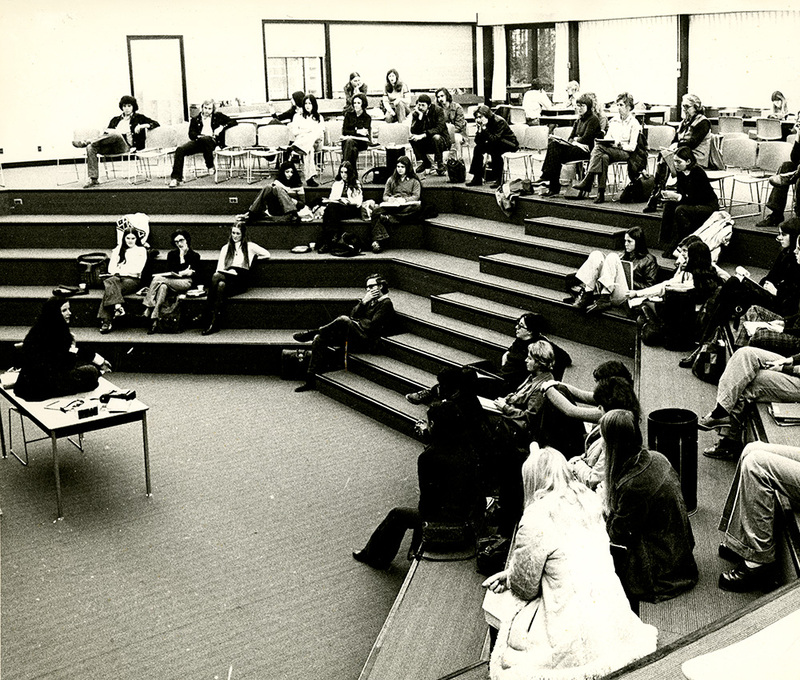 “Reminiscent of Roman amphitheatre, the Cafetheatre at Capilano College is the largest teaching area on the campus and is used not only for educational purposes, but entertainment as well,” states a 1973 article in The Citizen, highlighting the opening of the Lynnmour campus in North Vancouver. An innovative teaching and learning space, the Cafetheatre was used primarily for Humanities and Social Science lectures, but also hosted Club Days, film screenings, live bands and pub nights. Student turned faculty member, Greig Gjerdalen, recalls listening to live folk bands there and running beer nights to raise funds for the championship rugby team, of which he was a member. “I also remember watching a film there about Jimi Hendrix and Janis Joplin, who both overdosed and died. I think it was to scare students away from drugs,” says Gjerdalen, who attended Capilano College from 1978-80. Filled in during renovations in the 1980s, the Cafetheatre is still there, preserved under the floor of the CSU Lounge in the Library building. “Perhaps a future team of archaeologists will unearth it and wonder at its purpose,” says Hovden with a grin.